In 1616, the year of William Shakespeare's death, and probably but a stone's throw from his Globe Theatre at Southwark just south of the River Thames, a group of people founded the earliest Independent Church ever founded to survive to the present day. "Joyning togeather they joyned both hands with each Brother and Covenanted togeather to walk in all God's Ways as he had revealed or should make known to them." The King's officers discovered the congregation in 1632, imprisoning 42 members of the congregation including the Pastor. Whilst he was imprisoned, his wife died, and his children had to resort to begging on the streets of London. On release from prison, 30 members of the church were exiled to New England, settling initially in Scituate, moving to Cape Cod in 1639, to found the town of Barnstable. By 1717, the town had expanded to the point where it was divided into East and West parishes, and the construction of the West Parish Meeting House was started. Once completed, it served not only as a church but also as the home of the Barnstable town meetings and later even the school. In 1852, the building was so extensively modernised that little clue remained as to its original appearance. By the late 1930s, however, the building was all but derelict, and it was only due to the tenacity of one Elizabeth Crocker Jenkins that the building was not only saved but restored to its former glory. 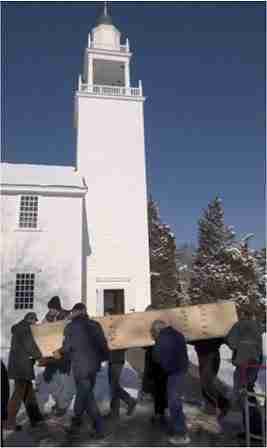 With a significant historical building such as West Parish Meeting House, the introduction of a new organ needs to be done with extreme care. None of these meeting houses had organs in their early years, so there was no model on which one might base a reconstruction. Our broad aim was to create a case design such as an early to mid 18th century English immigrant organ builder might have envisaged for such a building. There was only one place for the organ and that was on the gallery with most of the instrument contained within the space offered by the tower. This dictated the overall size of the organ. West Parish Meeting House has a very nicely executed reproduction pulpit, based closely on the few such pulpits which still exist. 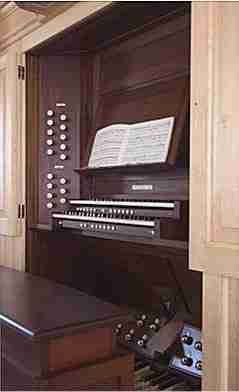 The mouldings and general woodworking style was immediately recognisable as being appropriate for an organ case, so we used this as a starting point. Of particular interest was the material to be used for the case. There is much reference to Pumpkin Pine for the interiors of such early buildings in the New England area. It would seem that the term does not refer to a specific species of tree, but to the colour of the pine once it has matured over some years. A number of pine varieties seem to have attracted the term Pumpkin Pine and we used a variety indigenous to North America. Not only the broad outline of the case design was subject to discussion and consultation, but the detail as well. Much thought was given to the carving and it was felt by the Meeting House foundation that bas relief carving would be more appropriate than the usual pierced carving. Designs were sent back and forth and ultimately motifs appropriate to the Meeting House and Cape Cod were settled upon. The scrolling above the intermediate pipe flats is evocative of the waves of the sea, whilst the segmented tower shades feature the indigenous rosa rugosa. For all the attempts to make the organ fit the building visually, it was felt that musically it had to address the requirements of a modern congregation. This could have lead to a situation where the case design leads one to expect something completely different from the sounds emerging from inside it. The importance of the eye in assessing the sound of an instrument is often underestimated. Just as the eye prepares the pallet for a glass of wine, so should the eye prepare ones ears for the sound of an organ and certainly not mislead them. 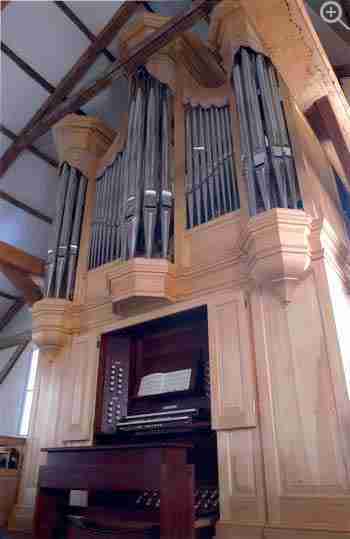 A case of such characteristic design prepares the ears for something fairly specific, most significantly, the warm broad Open Diapason sound of English organs of the period (and those of some of the emigrant builders to the New World). The key action is suspended as the internal layout of the instrument and the accommodation of two large single rise bellows suggested that suspended action would work best. Because of the construction of the meeting house, the organ is built around various beams and trusses of the Meeting House which presented some interesting problems in the design. Some of these beams can be seen in the photograph and make photography difficult which is why the picture has been taken from such an unusual angle.The drawstop action is electro-mechanical with a 64 level capture system for general and departmental pistons. As can be seen from the specification, two stops are borrowed mechanically to the Pedal. The requirements of a Pedal stop tend to be different from a manual stop and as in previous installations, a system was developed whereby the Open Diapason pipes in the lowest octave are fed with a little more wind when used for the Pedal Principal 8. The Trumpet 8 does not have this facility because reed stops are too sensitive to differ any difference in winding to make that possible. The partially completed organ was first used during the Sunday Worship on 13 February 2005, less than half the stops proving adequate enough to lead the congregational singing and for the postlude. Plans are in hand for dedication recitals and the organ is intended to become another facet of the outreach programme of this growing congregation. View the Specification of the organ of the West Parish of Barnstable (completed 2006) and the pipe scales.